Cost: No retail cost. Traded from Scotland for a box of cashmere from China (gift from my aunt). A lot of airline mileage but no money exchanged. 1. To accommodate the heavy yarn, I followed the pattern for the smaller size, took out one braid panel (chart B) from each side of front and back (total four panels taken out) to make body narrower. 2. Instead of fringe, I used the braid pattern (chart B) as edging on the bottom on the body. 3. I used the same braid pattern for neck band, and a simple 3 x 3 cable for the cuffs. This is one of the more complex cable sweaters I've knitted. The construction and cables are straight forward and given the oversized look on the model I was ready for modifications. I was determined to use the Scottish wool for this pattern, even tho it's heavier than called for, and that brought on more adjustments. From this and couple of sweaters this year -- Peppermint Ginger, Light and Lacy -- I've learned how important finishing is in fitting. Knitting (and crochet) creates fabric, and finishing is the step to make the fabric into a garment fit a grow human's body. If you are a selfish knitter like me and mostly make things for yourself, you want them to fit! The tinkering doesn't scare me, I'm just glad it all worked out fine and I'm happy with the result. Happy Friday and Merry Christmas! Join the party on Andrea's blog, Tami's blog, and leave me a comment! Absolutely stunning! Seeing it in process still doesn't prepare you for the finished sweater. I LOVE it! Merry Christmas! Thank you for sharing your fiber arts adventures each week. You definitely inspire. I'm completely in love with that sweater! You did it...and WOW...does that color ever look beautiful with your complexion! Have a very Merry Christmas, Vivian!! FAbulous. YOU did a beautiful job on one of my favorite patterns. Merry Christmas and more great knitting in the new year. You are one of the fastest knitters I know! Your sweater is beautiful and a very nice color too. I hope you have a wonderful holiday weekend. Give that Rascal some pets for me. Turned out beautifully! I love the color! Merry Christmas! Oh this is gorgeous!! You did a fantastic job. What an absolutely complex sweater this is! Really gorgeous, your knitting is wonderful! Best wishes! VdV, you are right about the mornings, this thing is incredibly warm! It's fabulous! I'm standing and applauding. 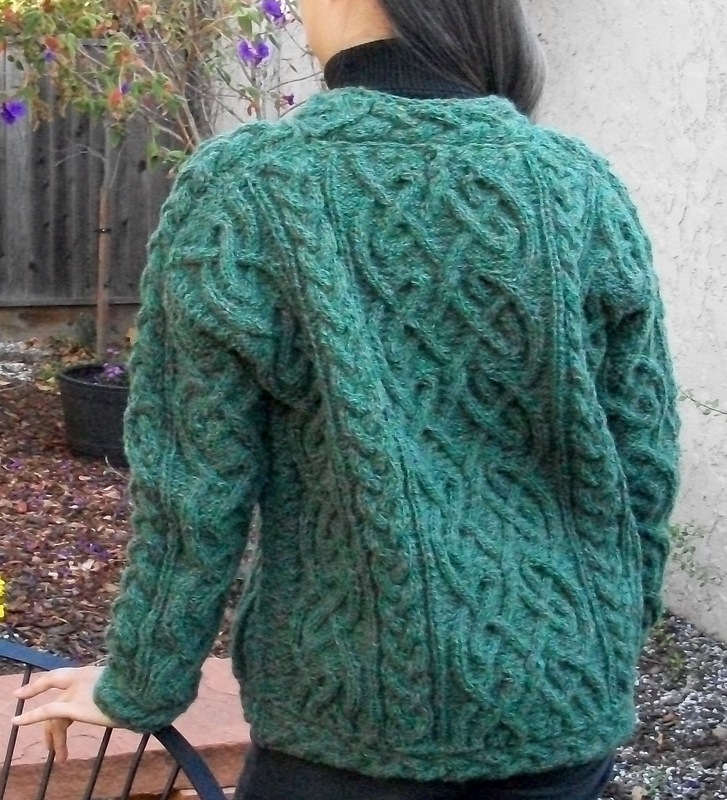 And you beat me ... my monstrously cabled sweater is not done! 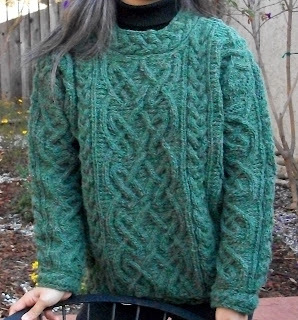 What an awesome sweater, and a great use of bartered yarn! Wow, that's an epic amount of cabling - it looks great! After you told me about it, I had to come and take a look at your St. Brigid. You have certainly knitted a work of art! I personally would be terrified to wear it because of the time and effort put into it, but it is so beautiful I wouldn't want to take it off!